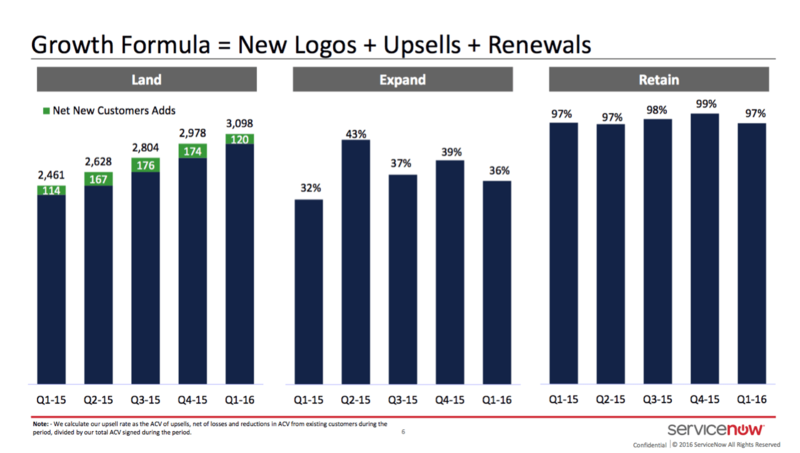 In ServiceNow’s Q1 Investor presentation are the first semblances of SaaS metrics in public company reporting. If you sift through the 40+ public SaaS businesses, you won’t find mention of annual recurring revenue, churn, account expansion, or cash collection cycles in most of them - even though these are the the metrics the management teams employ to evaluate and steer their businesses. ServiceNow hasn’t published metrics on ARR or payback period, which for most public investors are still esoteric terms. Instead they frame their growth in three parts, familiar to SaaS operators everywhere: land + expand + retain. The image above shows Q1’s triptych of new customer additions, expansion as a percentage of new quarterly bookings and quarterly dollar revenue retention. A second slide reveals the contract length for each element of the growth trio. 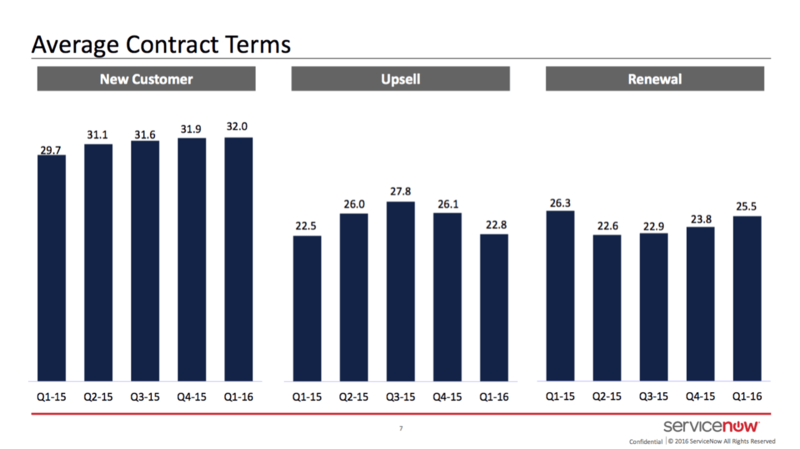 32 month average contract duration for new business; 23-26 month for upsell and renewal. At a $1B in annual revenue and nearly $12B market cap, ServiceNow is the third most valuable public SaaS company after Salesforce and Workday. And with an average contract value of roughly $300k, ServiceNow falls squarely into the enterprise segment of SaaS businesses. ServiceNow’s effort to communicate to investors how the management team measures and guides the business in straightforward terms, rather than industry jargon, is an important step in educating the market on the differences between subscription software companies and traditional licensed software businesses. In addition, SaaS startups might also benefit from segmenting their reports in this way, particularly as the business scales and the fraction of revenue from renewals and expansion outpace new bookings.